I signed up for Total Wireless in January 2018 to review their prepaid wireless service. It’s already April 2018 and I am long overdue with this review so I decided to start with a summary and share my thoughts and conclusions. I’ll follow up later with more details in a follow up article. Total Wireless is a prepaid wireless service. It uses the Verizon network, or towers. If you use your phone in places where the Verizon network has coverage Total Wireless might be a good choice for you. Total Wireless is a brand owned by Tracfone, a leader in the prepaid wireless business. Tracfone also owns a number of other prepaid wireless brands including Straight Talk, Net10, Simple Mobile, Family Mobile, and several other lesser known brands. For my review I signed up for Total Wireless’ $25 single-individual line plan with unlimited talk and text. This plan does not include any high speed data. 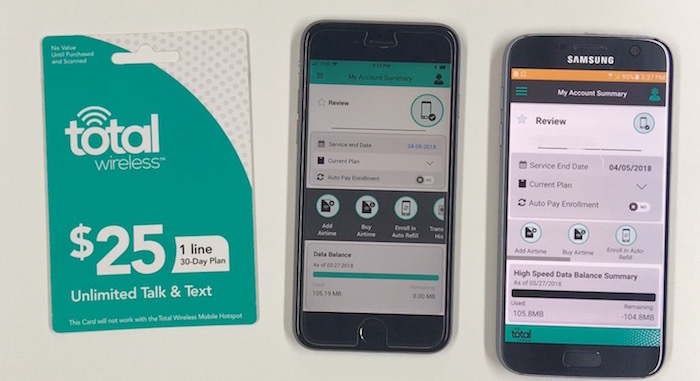 Total Wireless offers a 5GB data add-on for $10. This data carries over and does not expire for as long as you keep your phone active. I decided to try the add-on data for my review. This add-on data feature is great, at $10 for 5GB that averages out to $2 per GB. That is the best deal in add-on data I have seen and this data never expires. I signed up for the Total Wireless $25 plan and took advantage of their Bring Your Own Phone (BYOP) option. I signed up using my Samsung Galaxy S7 but also tried the service by moving the SIM into my iPhone 6s. You’ll need to check that your phone is compatible / eligible for the BYOP plan on totalwireless.com. I’ll add a link here to show you how to do this. Before I signed up I bought a Total Wireless BYOP SIM Kit and a $25 Plan card. You can order these online or buy them from a retailer like Best Buy or Target. I signed up online at totalwireless.com. I opted to get a new phone number but you’ll also have the option to transfer your current or existing phone number to Total Wireless. The signup process was quick and I didn’t have any issues. If you decide th transfer your number you’ll need some additional information from your current carrier and the transfer could take up to 48 hours. After I signed up I put the SIM in my Samsung Galaxy S7. Setup was simple, I needed to change the APN value in settings. Once I did this my phone was ready to go. My iPhone 6s did not require any setup. When I inserted the SIM the phone automatically set up the APN. Whenever I review a prepaid wireless service, I check that the basic features are working immediately. I was able to make and receive phone calls on both the Galaxy S7 and my iPhone 6s. I tried calling several home and mobile phone numbers. The calls were clear. I had no dropped calls and no problems connecting. I was also able to send and receive text messages on my Galaxy S7 and my iPhone 6s without issue. I also was able to both send and receive MMS picture messages and group texts on the Galaxy S7 and iPhone 6s. When you try this on your iPhone 6s you need to make sure you try picture messages and group texts with someone that doesn’t use an iPhone. You want to check that MMS is working and not just Apple’s iMessage. Both the Samsung Galaxy S7 and iPhone 6s were able to use voicemail. The Galaxy S7 however had Visual Voicemail. The iPhone 6s had regular voicemail, you have to dial in and listen to your messages. Total Wireless doesn’t officially support Visual Voicemail so if it doesn’t work for you I wouldn’t expect too much help from Customer Service. Finally, I was able to use cellular data to connect to the Internet with both the Samsung Galaxy S7 and iPhone 6s. I’ll discuss cellular data more later. I also checked to see if I could see could use a number of advanced 4G LTE features with either phone. Most did not work. Wi-Fi Calling did not work on either Galaxy S7 or iPhone 6s. The option to turn on Wi-Fi calling was missing from the settings. I checked Wi-Fi calling on both phones with a Verizon postpaid SIM and it did work. Personal Hotspot & Portable Hotspot did not work with either the Galaxy S7 or iPhone 6s. I tried to enable it in the settings. Both phones gave error messages. I also tried to see if I could tell if HD Voice worked. I could not hear the difference in call quality. My Galaxy S7 showed an HD indicator for all calls made. The iPhone has no such indicator. I was able to use simultaneous voice and data on both my Galaxy S7 and iPhone 6s. I was had an LTE data connection and was able to use Chrome and Safari to read the web while on a phone call. I wanted to tell you a little bit more about cellular data. I found the 4G LTE data speeds to be as fast as Verizon Wireless Postpaid. I did not observe a max download speed. Verizon used to impose a 5Mbps max download speed on all prepaid services that used their network. That is no longer the case. I found the speeds to be similar to Verizon Wireless postpaid. Verizon’s 4G LTE network isn’t that fast in my area. I did a video comparison of the speeds back in January 2018. You can see that here. For my review I was going to sign up for the $25 plan and try out the $10 5GB add-on data. But I am getting data on my $25 plan. The data was just working so I didn’t add any. So far this month, I’ve used 1.5 GB of data and it is still working. I’ve had free data for two months. I used up most of that 1.5GB of data watching YouTube. Perhaps I’ll try a movie on Netflix and see how much data I can use. I would have liked to try the add-on data for the review but that would be like signing up for basic cable, finding out you have free HBO, and then ordering HBO anyway. In conclusion, I like and recommend Total Wireless for anyone that wants prepaid service in an area were Verizon has the best or is the only network with coverage. I think the $25 plan I signed up for along with the add-on data that averages $2 per GB is an amazing deal. For me that is a better option than their $35 5GB plan where the data expires every month. The family-shared plans are a good deal if you need two, three, or four lines too. On the downside, Total Wireless doesn’t offer an unlimited plan. Straight Talk’s $55 unlimited plan on the Verizion towers may be an alternative. Also Total Wireless is missing many of the advanced features that Verizon postpaid offers. And many of those features are available on Verizon prepaid for less money than Verizon postpaid but still more expensive than Total Wireless. Finally I want to point out that Verizon prepaid had recently added a $30 plan with 500MB of data which may also be an attractive option for some as well. First don’t believe their web site. Wi-fi calling will not work on Verizon phones on a BYO phone activation. It says it will. Your IMEI will say good to go but it will not work. I spent 3 hours on the phone to get the account setup and 2 phones activated. Got disconnected after an hour on the phone with first rep when I asked to speak with a rep that spoke reasonably fluent English. After about 5 hours total phone time with customer support that could not get either phones wi-fi calling working I said I wanted a refund. They then lost the connections again. Another 30 min call I got someone and they said “so sorry – you used 300mb of your 22 GB data so we can’t refund your $$. I said the rep told me to go to google to see if data was working. How are you supposed to find out it’s not working if you don’t try it? Their rep told me to do it. I had to go back home and get the order number off the home PC email which is where the order was created. Then another hour on the phone through multiple people to get the address to send the sim cards back to to obtain a refund. This is the most painful experience I’ve ever had with anyone anywhere. I would not recommend them to anyone. Hopefully they will actually refund my $$$ when they get the SIM card back. My monthly bill was usually just over $200 every month, it was crazy expensive, but Verizon was the only one that worked well so I stuck with it. I heard about total wireless from Clark However and read several reviews. I was really worried about switching over service and having problems and/or worse losing my number when trying to port over. However, I went through the porting process online carefully following directions on each phone. They said it could take up to 2 hours to 48 hours to port. However, I think it took less than 10 minutes to port over all 3 lines and have them working. Just make sure you are armed with all account information and pin/passwords from current carriers before you start the process. Honestly since switching over from Verizon I really can’t tell a difference in the quality of calls and data. The only obvious change was the bill I was paying every month. I am paying less than half of what it was when I was at Verizon. I think the only thing I lost was the talk to text feature which was nice, but honestly for half the price I gladly accept that. Thanks for sharing this Jeff. Well said. I agree with you I could not tell the difference between calls and data which makes it a great choice for many Verizon customers. Some people rely on some of the other advanced features making Verizon prepaid a better alternative. Can you clarify what do you mean by “advanced 4G features” and which features you have issues with? They are discounting the phone $70, so they are requiring you to buy a plan. Usually they make that clear with a statement saying the plan purchase is required. And they can do that if they want. But I have a solution for you. Buy the phone with the $25 plan and use promo code TW50OFF at checkout and you’ll get the phone and the plan for $54.99. That’s $5 cheaper. If you use a different plan, I’d add that one to the cart instead. It will cost a little more, but you can add the plan to your account in reserve and use it when you need it, so it isn’t going to go to waste.